After Arjun Reddy, Vijay Devarakonda has once again hit the bull's eye with his recent outing Geetha Govindam. 3 among his 4 film releases have turned blockbuster, and Vijay has now come close to big league. Geetha Govindam has officially crossed the US$ 2 Million mark and is still running successfully. 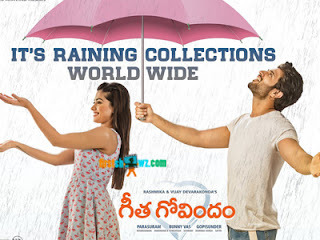 The film is also set to reach 50 Crs worldwide share, and even after 12 days of release, Geetha Govindam is doing stunning at the box-office. The film has set a new record in Kerala by becoming the first straight Telugu movie to enter the 2nd week. Starring Vijay Deverakonda and Rashmika Mandanna, Geetha Govindam is directed by Parasuram and produced by Bunny Vas under GA2 pictures banner. Gopi Sunder's music is another major highlight of the movie.